Does the Fendergrip work as easy as it looks? Yes. Pushing the black button drops the fender exactly where you want it. To go up, grab the Fendergrip and pull the free end of the line. Does the Fendergrip come with the line and fender? No. Fenders and lines are manufactured and sold by other companies. Do I have to buy a specific model Fendergrip for my line size? No. There is only one model Fendergrip which is a universal fit. We recommend 3/8", 7/16", or 1/2" line. What if my line is bigger than 1/2"? First, doublecheck and measure your line size. Many boaters think in terms of their MOORING line size which is often 5/8" and larger. As a 5/8" line will not fit through the holes on most fenders, chances are good that your FENDER line size is smaller. If you do have 5/8" or larger line, your option would be to change the fender line to 1/2" double braid, which is typically rated at 7,000 lbs test; this is more than enough strength for ANY fender and costs about 45¢ per foot. Do I have to use braided line? No. The Fendergrip works equally well with twisted or braided line. What holds the Fendergrip on the rail? The Fendergrip is the only fender adjuster that uses the fender's line to hold itself to the boat; the fender line is still holding most of the fender's load. This makes the Fendergrip's hold on the fender much more secure than any other fender holder on the market. What size rail can I use the Fendergrip on? Any size diameter and shape of railing works well; round, oval, or square. What if my rail is bigger than 1" diameter? Will this be a problem? No. Whatever the size or shape of rail, the Fendergrip will perform 100% perfectly. Although a rail larger than 1" in diameter will not be sit completely in the saddle area, the saddle will act like a self-centering notch beneath the rail. In fact, we could have made the Fendergrip without a saddle altogether, and its top would have been solid and flat; the performance would have been just as great. In short, "not sitting completely in the saddle" is an aesthetic issue that cannot be seen when viewed from above the rail. To see how different rails fit the Fendergrip, look at the Fendergrip on an oversized rail and the Fendergrip cutaway picture. What about oval wood rails? Fendergrips work just fine on wood rails. In fact, when wood rails are over 2 1/2" width, the Fendergrip will not even touch the underside of the wood rail. A rule of thumb is as follows; if you presently tie your fenders to your wood rails, then you may use the Fendergrip effectively. Please note that a fender line may chafe a highly polished wood rail; this is an issue to some boaters. For those who finish their wood rails seasonally, this is not an issue. Fendergrips work well on square rails. Many of our customers have pontoon boats or house boats with square rails. Will the Fendergrip allow the fender line to be pulled through? No. If you use a 3/8", 7/16", or 1/2" line, the fender height will not change unless you push the button. How strong is the Fendergrip? Using a 1/2" double-braided line, the Fendergrip will hold up to 847 lbs as a static load. Is my boat too small to use Fendergrips? No. 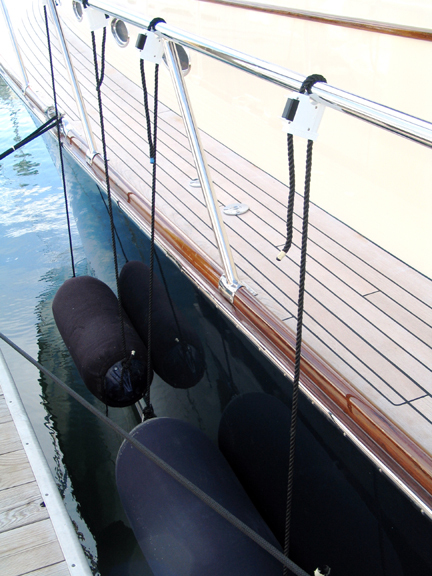 The beauty of the Fendergrip® is that it may be used on small dinghys, or large yachts. The smallest boat we know of using Fendergrips is a 13 foot Boston Whaler. With rails down both sides, the Whaler's owner bought the Fendergrips not only for the ease of adjustment, but for the fender storage it provided when using the fender horizontally. Is my boat too large to use Fendergrips? The largest yacht we know of using Fendergrips is 112 feet long and uses hole-through-the-middle (HTM) foam core fenders. The name of this Hatteras Motoryacht is "My Marilyn". How do you place the Fendergrip on the rail the very first time? Pass the line up through the side opposite the black button. Then over the rail, push the button, and down through the other hole; that's it! After this first time use, the idea is to store the Fendergrip with the fender so that it's ready to use next time. I like to move my fenders around; does the Fendergrip have to stay where you place it? No. It is easily removed and placed elsewhere. How easy is it to reposition the Fendergrip on another part of the boat? It's very easy. Push the Fendergrip's button and let the line run out of the top. Then go place it where you like, push the button, and drop the line back through. What happens to the Fendergrip when you remove your fender after use? The Fendergrip locks on top of the fender for storage. The Fendergrip can also be used to lock the fender in a fender holder if traveling in rough water. What's are the TOP 10 reasons to buy the Fendergrip? 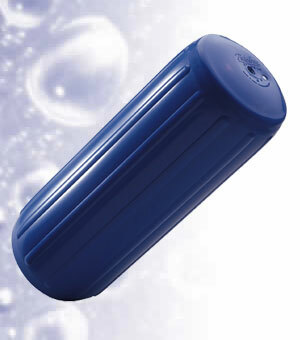 Rated 5 Stars by West Marine's customers, our product really works as advertised! Many competitors claim their products work, but in the real-world boating environment, these products can actually hinder fender use. 2. Push button speed and safety. It takes time to tie knots and adjust fenders when you're away from the comfort of your dock. In result, boaters often do not use fenders because of the hassle in adjusting them, and fend off another boat, or a dock, with their hands and feet; this is extremely dangerous and often can result in serious injury. Fendergrip offers you instant adjustments and lets you use your fenders more effectively! 3. Tails and adjusts lines under load, without transferring the load to your hands. Holding a fender line under load is very dangerous; a line may be easily ripped from you hand. 4. Uses the fender line to secure the fender to the boat! OTHER fender adjusters use a strap, suction cup, or hook to hold the fender to the boat. These designs greatly reduce the load the fender can handle and are easily stretched, pulled off the boat, or broken, when loaded severely. The Fendergrip's unique design enables you to clear the channel and release the line no matter what the load. Some other products will deform or jam under a severe load; damaging the fender line and making further adjustment impossible. 6. Fender storage that will not block your view of the horizon. When using two Fendergrips with a horizontal hole-through-the-middle fender, the fender may be pulled up, and stored against the rail or life-line. This also means that there are no costly fender racks to buy, install, or obstruct your view forward! Fender racks can block up to 1/3 of a boater's view of the horizon! 7. Also stores with the fender. If you take off your fenders and place them in a locker or fender rack, Fendergrip is the only adjuster that stores atop of your fender ready for the next use; other brands must be stored separately! 8. Everyone knows how to push a button! Even a child looking at the Fendergrip for the first time intuitively knows that the black push button is what releases the line. Take any person and hand them one of the competitors' devices and they will have no clue as to how to use them! Go ahead and use your Fendergrip and see if you can break it. In the unlikely event that you do, just send it back to us with a receipt showing when you purchased it, and we will repair or replace it with a fresh one! 10. 30 day Sea Trial™. Try our Fendergrip for the 30 days and if you are not completely satisfied, return it for a full refund (less the original shipping charges if applicable). Of course, the Fendergrip returned must be in resellable condition. Should I use a stopper knot in the end of the fender line with the Fendergrip? Yes. A stopper knot provides a physical stop for someone unfamiliar with the Fendergrip; if a crewmember simply pushes and holds the release button, the stopper knot will be a failsafe to prevent the loss of a fender. On a vertical fender, a slip knot is a good choice for a stopper knot as it can be easily undone to remove the Fendergrip with the fender. When using two Fendergrips in a horizontal storage mode, a figure-8 knot makes a good choice for a long lasting stopper knot, as the fender will be stored against a railing and not removed. How do you use 2 Fendergrips to store a fender? Storing a fender using Fendergrips works well on a bow rail or a life-line. A hole-through-the middle fender (8" diameter or larger) with at least 12 feet of line works best. You may need more line depending on the distance of your rail, or life-line, above the water. The line should be centered on the fender with knots at both ends to prevent lateral movement. One Fendergrip is installed at each end of the fender and a figure-8 knot makes a lasting stopper knot.Both ends of the fender are then lowered for horizontal use, or one end lowered for vertical applications. Both sides are then raised for storage. Everyone uses fender racks to store fenders... Why should I store a fender using Fendergrips? 1. Blocking the Captain's view of the horizon. This is very dangerous when going on plane in a power boat, as well as when docking. Storing the fenders using 2 Fendergrips opens your view of the horizon and makes fenders ready to deploy. 2. Inconvenient and cumbersome use. Fenders are NEVER used in the pulpit area. The fender, however, will always have to be retrieved from this area, moved, installed, and then deployed for use; this requires 4 steps. With Fendergrips, there is only one step from fender storage to deployment! 3. Damaging the finish of the rail and the deck. 4. Price; fender racks are expensive and are priced at $250+ (for a pair of double stainless steel racks). What happens to the extra line when you are storing the fender? The excess line can be wrapped around the fender, and the ends may be tucked between the rail (or life-line) and fender. If you remember the acronym "BUT", this stands for "Behind the button", "Underneath the rail (or life-line)" and "Tuck the line". Once the fender is cinched up to the rail (or life-line), take one of the line ends and pull it behind the button, then underneath the railing (or life-line), pull the line parallel to the rail, and tuck the line between the fender and rail (or life-line). Then do the same for the other side. How many Fendergrips do I need? Those who try the Fendergrips at boat shows know that we suggest a minimum of 6 Fendergrips for your boat. 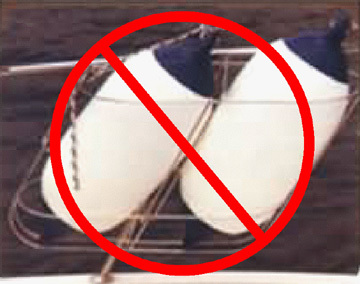 If you follow our suggestion to horizontally store a fender on both the starboard and port side of the bow rail, that will require 4 Fendergrips alone. 2 more will be left to hang 2 more fenders vertically at the aft end on either side. This set-up covers the average boat and is most popular. How does the Fendergrip grab the fender line? The side with the push button houses a pivoting cam that is biased by a stainless steel compression spring. The cam is coupled to the push button so that when the button is pushed, the cam releases the line. When the button is released, the spring naturally sets the line in place. Want to see the inside of a Fendergrip? Go to the Fendergrip cutaway picture. Will the Fendergrip damage my fender line, or my rail? No; the fender line and railing still look great after thousands of cycles! What is the Fendergrip made out of? Dupont®'s Delrin®, a resin most often used for high-end marine applications. Delrin® maintains it's strength and color after being exposed to the sun and sea for years. It contains an ultraviolet (UV) inhibitor that screens out damaging sun rays. Many competitors use nylon which is a cheap and weak material. Nylon loses its strength and color with sun exposure. Are there any metal parts in the Fendergrip? Yes; four 316 stainless steel screws and one 316 stainless steel compression spring. Has there ever been a spring failure? No; and there are over 500,000 Fendergrips in use! How long has the Fendergrip been on the market? The Fendergrip was introduced in June 1993. What is the suggested retail price of the Fendergrip? The suggested retail price of the Fendergrip is $19.95. Why do some retailers charge more than $19.95? New World Marine can only advise retailers what the suggested retail price is for our product. Retailers are free to charge above, or below this advised price, depending on how competitive they want to be in the marine marketplace. The Fendergrip seems expensive. Why so much? Actually, the Fendergrip is priced within a dollar or two of most other competing fender adjusters that are less useful and less durable. In fact, many other fender adjusters are so poorly made, that they require replacement within a few months of use due to malfunctioning, or breakage. Of course, unless you are present when the other, cheaper adjusters fail, you not only will lose your adjuster, but the whole line and fender as well! Most importantly, the boat will have lost the protection of the fender. The Fendergrip is a one time purchase that should last you the lifetime of your boat. Why not spend a few dollars more and get the best! We are the number one selling fender adjuster for a reason; there are no compromises when it comes to the quality of the Fendergrip's components; only the best materials are used and hand assembled for perfect operation. What does the Fendergrip packaging look like? Click here to see the packaging. Why don't the large marine stores carry the Fendergrip? The Fendergrip IS carried by West Marine, Overton's, and Gander Mountain. Unfortunately, politics control what products get shelf space, and in result, Fendergrip availability can be spotty. Fendergrips can always be ordered from the store's catalog; you may even have to show the sales associate that it is in there. However, we would greatly appreciate it if our customers would COMPLAIN to their local store's manager to have Fendergrips in-stock. Are there any other products that have the Fendergrip's design? No. The U.S. Patent & Trademark Office has issued two patents for the Fendergrip's unique design. I think I already have Fendergrips on my boat, or I have something just like this. Do you? It's surprising how many boaters now use our brand name "Fendergrip" to refer to all fender adjusters. Although we appreciate the compliment, some other manufacturers have further confused boaters by using similar product colors, packaging, and photographs. There is only one push button fender adjuster; the Fendergrip. Compare the Fendergrip side-by-side with anything else on the market. Chances are, you will be very impressed with our product. Where is the Fendergrip made? Fendergrips are made to our strict standards in Taiwan, ROC. Why is the Fendergrip made overseas? Is the quality still excellent? 1. Increasing our Production Volume: We needed to supply larger numbers of Fendergrips to our customers, and we were no longer able to pace the sales demand with in house production. 2. Keeping our Pricing Low: We wanted to maintain our current pricing (which has never increased since 1993), and the rising cost for tooling and materials meant we would have to raise our prices if production remained in the U.S.
Be assured that providing you with a top quality product is our first priority, and our partners in Taiwan produce a Fendergrip of superior quality using the same exact DuPont Delrin® resins that we always have used. In fact, the Delrin is still produced in the United States, then imported to Taiwan for production. EACH Fendergrip® is carefully hand assembled, inspected, and tested for perfect operation before packaging. No. Since the specific gravity of Delrin is 1.6, the size of the Fendergrip would have to be enormous to create an air cavity large enough to achieve buoyancy.